An Italian painter and illuminator, Niccolò di Ser Sozzo Tegliacci is said to have been the son of an illuminator from Siena. First record of him is in Siena were he was listed to be in debt to the city in 1348 and first record of his paintings was not until the 1350s. This includes a polyptych, Virgin and Child with Four Saints, from 1362. 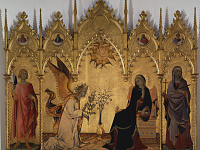 This work is also signed by the Sienese artist, Luca di Tommè (active 1356 – 1389), assumed to be a collaborator. Though, the illuminations attributed to the artist are dated much earlier. In 1363, Tegliacci is noted in the Book of the Arts, (Libro delle Arti), from Siena. Of his full-sized paintings is his, Madonna and Child, now in the Uffizi Gallery. In 1919, this latter piece was stolen from the church of Sant’Antonio in Bosco near Poggibonsi, and then given to the Uffizi in 1933. His other known panel painting, perhaps his earliest known, is a Madonna and Child with Two Angels, from the 1350s.